TH723 White, scrim tape with an ultra aggressive acrylic-based adhesive 10 105 oz. Permanent Bonds well to nearly all materials, including foam, carpet and plastic baseboards; used for adhering moldings to ceilings, walls and modular units. 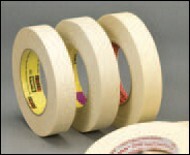 TH750 White, cloth tape with a high tack rubber-based adhesive 10 110 oz. Permanent Instant tack on rough surfaces, splicing of textiles, bookbinding, metals, secures polyethylene film to brick and cinder block walls. 591 White, paper tape with a removable, rubber-based adhesive 7 52 oz. 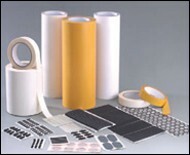 Removable Holds textiles on screen printing pallets, plastic and metal to computerized engraving and CNC tables, fabrication of golf club grips and general purpose bonding. TH2472-TH2436 White, hand-tear tissue tape with a high tack acrylic-based adhesive, 36 and 72 yards 5.1 77.6 oz. Permanent Bonds banner hems, nameplates, badge ribbons, signs, promotional displays; used for splicing of paper, plastic films and foil. TH400 Transparent, hand-tear tissue tape with a medium tack acrylic-based adhesive 3.54 44 oz. Permanent Bonds nameplates, scrapbooking, badge ribbons, signs, promotional displays; used for splicing of paper, plastic films and foil, scrapbooking. TH495 Transparent, hand-tear tissue tape with a medium tack acrylic-based adhesive 3.54 44 oz. 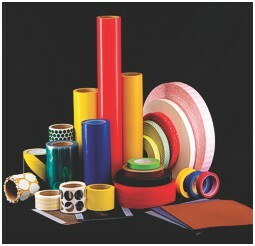 Permanent Bonds nameplates, badge ribbons, signs, promotional displays; used for splicing of paper, plastic films and foil. TH958-TH9572 Transparent, hand-tear tissue tape with a medium tack acrylic-based adhesive, 36 to 72 yards 5.5 70.6 oz. Permanent Bonds nameplates, badge ribbons, signs, promotional displays; used for splicing of paper, plastic films and foil.